Subscriptions to newspapers are down. Newsstand sales are down. Most people get their news from the web (or Jon Stewart). This what we are hearing. But I would posit that we need both the analog paper and the online interactive edition found on the web. I have been a regular reader of The New York Times for over 20 years, and still to this day I get the real paper (yes that’s right actual paper printed with ink) delivered to my driveway every day. I try to get through it the same day, but many times I have other priorities. On those days the paper is carefully stacked in a small basket in the kitchen. No paper is recycled before I read it. I think the record is 3 weeks piled up at once. I carve out a day on the weekend and start a marathon session to catch up. Until recently I would have said that the paper is superior to its web counterpart. But with the evolution of Web 2.0, a newspaper online can be an elegant thing to behold. The craft of using this new technology is advancing quickly. Doing it right requires a team of artisans, more akin to making a film than anything else I can think of. It is the confluence of writing, graphics, speech, video and web usability principles. I am taking this week off of work, so I am up to date; today’s paper read today. Nice feeling. But I digress, so let’s get back on track. The NYT multimedia skills are being put to great use online. They have put a lot of money, resources and talent into the effort of publishing the news on the web. In the analog paper you get word and image type set on the page. Online you feel like you are inside the paper as well as the people that have produced it. I often read something in the paper and then go online to get more information and texture about a topic or story. Here’s a great example. 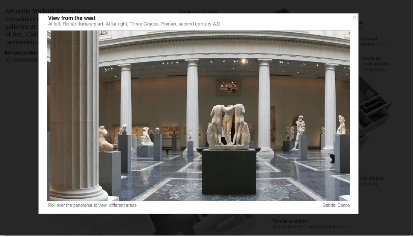 In the spring the Metropolitan Museum of Art opened their newly renovated Greek and Roman galleries. Reading the article by chief Times art critic Michael Kimmelman, was wonderfully fulfilling. I have been in that museum many times and in those exact galleries prior to the make over, so his words got me looking forward to the time when I would visit next. But then I went online and saw this. 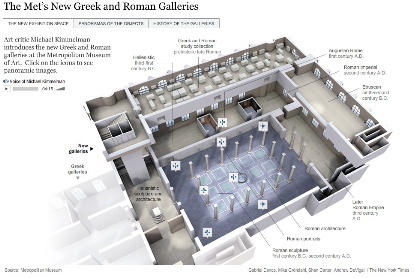 An interactive tour through the new galleries that can be easily navigated. When you mouse over the arrows you get a small window describing what you will see. Click and you are presented with panoramic views easily controlled with a slide of your mouse. Dive a little deeper and you can find accompanying audio by Mr. Kimmelman himself. Now I am really excited to go there, not just looking forward to it. I can also share this with my kids and get them interested in exploring something significant related to the advancement of our culture (not Transformers). And if you live many states away and don’t have the means to visit NY, you can use this to learn and have a much deeper experience than if you just read about it. Try it yourself here. So you are probably saying, yeah Steve great. But haven’t you heard about TV or video? Yes, but it’s much more difficult to get kids to sit in front of a screen and watch an “educational” video than it is to have them interact with this cool stuff on the web. I must admit it is even tougher for me to do that when I can get such a rich experience online. Add to that the ability to blog it, tag it and share it, and you have life lived in Web 2.0. Their brand has been positively extended and they have transformed journalism craft beyond the analog into digital cyberspace. The paper is still the best way to see what’s in the day’s edition and the web is the best way to experience what the writer is thinking as well as seeing. We need them both, at least for now. Previous Post: A WiFi Alarm Clock, But Will it Help You Remember Your Dreams?